1. Question: Is there a minimum order quantity? Answer: No, we produce starting from one piece. An ideal order quantity for production would be 100sqm or more. 2. Question: What's the size for a logo mat? Answer: Our Custom Logo Mats come in Standard widths of 40, 60, 70, 83, 103, 136, 200cm. Special widths and shapes are subject to a surcharge. 4. Question: What about the graphic design? Answer: The logo or the text is centered as big as possible on the mat except you order something else. The colors of logo or text are chosen from our standard color chart – as similar to the colors of your logo as possible. If you don`t want the original color of your logo for the mat, you can choose another one from our color chart. 5. Question: What kind of file request to do a logo mat? Answer: Image-files: JPG, TIF, PSD or EPS; BMP, PCX, scanned images (at least 300 DPI, bright, minimum 10x15cm). Please note: All layouts are produced centered and as big as possible if not ordered otherwise. Sometimes layouts have to be adapted to the process of production. Usually these adaptations affect the text. Letters have to be at least 4 cm to be readable on the mat. Avoid combinations of very similar colors with little contrast, e.g. marine and black. 6. Question: How does the printing of mats work? Answer: The blank mats are basically white. They get printed with your individual design according to requirements. The method is quite similar to ink jet printing. Therefore please check your available surface and the release motive very accurately. 7. Question: Do the mats have an edging? Answer: Mats always have an edging made of rubber, except you want a mat without edging. Due to this edging the mat lies plainly on the floor. The material is firm; the mats can be cut without being frazzled. This is possible but not recommended because of the danger of stumbling. 8. Question: How many colors can accept? Answer: Our mats can be printed around 12 colors and the pricing is same no matter there is one color or 12 colors. Hundreds of designs to select or customized design are accepted. 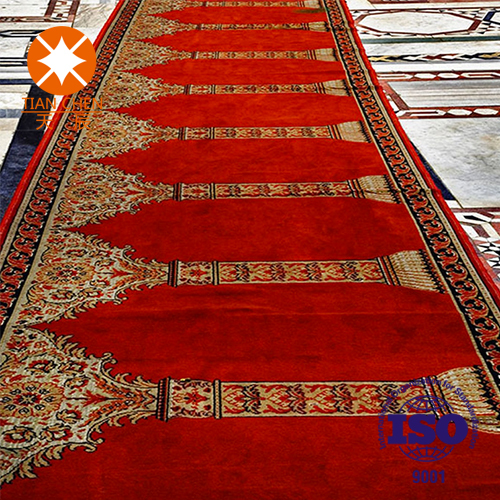 Looking for ideal Islamic Portable Bedroom Rug Manufacturer & supplier ? We have a wide selection at great prices to help you get creative. All the Bedroom Floor Mat are quality guaranteed. We are China Origin Factory of Bedroom Floor Rug. If you have any question, please feel free to contact us.